Robertson Ranches is a revered icon in the Quarter Horse World. Mary and Bradley Robertson have created an idyllic ranch in Plymouth, California with green rolling hills and towering oak trees, where their horses and Angus-Simmental cows graze on native forages in the Sierra Nevada foothills. When asked how she chose the lineage to produce Vinnie, Mary smiled and said that she had researched the pedigree of her favorite mare at the time, Shiners Siena. Shiners Siena’s dam was Taris Vintage and her sire was Shining Spark. Taris Vintage has an outstanding record as a dam and grand dam, producing numerous winners in the reining and cow horse world. 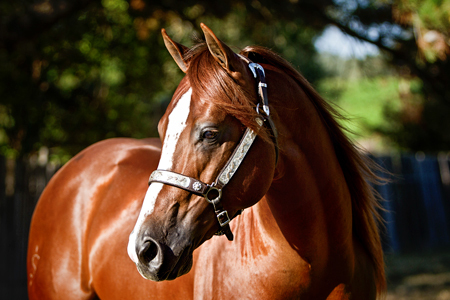 In 2014 Vinnie’s paternal grand sire (Peptoboonsmal) and his maternal grand sire (Shining Spark) were recognized by AQHA as leading paternal and maternal grand sires. Both sides of Vinnie’s pedigree are truly royal! Deciding on the stallion was fairly easy for Mary. Rod and Jeff Matthews, the owners of One Time Pepto, helped orchestrate what line of breeding Mary should follow. The result was One Fine Vintage, the embryo transfer foal from Shiners Siena and One Time Pepto. In 2013 Vinnie won the Idaho Reined Cow Horse Association Derby as a four-year-old. He also won the Arizona Sun Circuit Quarter Horse series of shows as a five-year-old. As with all performance horses, making show and trainer choices takes consideration and strategy. “We got to a point where we were ready to make a change when Ron and Vinnie reached the end of the horse’s limited age events,” notes Mary. “My husband, Ron and I mutually agreed that it was time for a change. I had noticed that Phillip Ralls had been experiencing repeated success with several different horses, especially bridle horses. I asked Phillip if he’d be interested in riding Vinnie, and he was willing to give it a try. Phillip puts a lot of emphasis on consistency with the horses in his training program, which we feel is extremely important for the longevity of our stallion’s show career. “We took Vinnie to him the first of the year, and Phillip took him to the NRCHA World Show in February in Ft. Worth, Texas. They made the finals in Open Hackamore, the division that Vinnie had won the World Championship the year before. This year, however, even making the Top Ten in the field of horses at Ft. Worth was much tougher than any class I’ve ever seen. The talent ran so deep — it was really tough. It was truly an honor that Vinnie made the Top Ten.” Phillip will continue the horse’s show career, including Two-Rein and Open Bridle events. This article was originally published by Pacific Coast Journal and was written by Kate Riordan.